If you go down to the woods today, you’re sure of a pungent surprise. Actually we rather like the smell of that because it’s all about garlic, something the French are internationally famous for being crazy about. 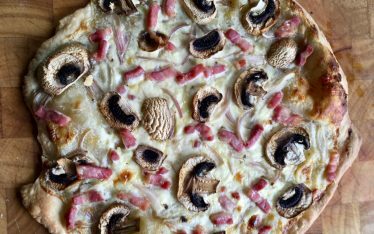 We’ve already talked about the importance of wine and chocolate in France (blogged elsewhere on the site) but, in the French pantheon of things you need in food, garlic is sans doute a cultural cornerstone sans pareil. We’re not sure if garlic is the national vegetable of France. Certainly it doesn’t feature in any web searches. 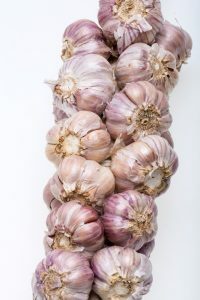 But it is the most ubiquitous ingredient in the cuisine and no chef worth his or her salt would ever be without a bunch of roped-together garlic cloves hanging in some corner of the kitchen. Tradition has it that French Kings of old used to share a bulb of garlic with their paramours prior to hitting the boudoir. Supposedly it has aphrodisiac properties, but it may just have been to standardise the bad breath quotient between lovers – and heaven knows what ‘morning after breath’ would have been like. 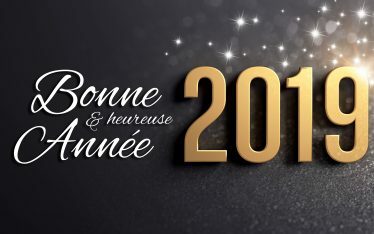 Then again France is one of the few countries in Europe where the population is actively growing – so there may be some sense in it after all! Although if you cruise with us on Papillon or Nymphea we leave chocolates on the pillow! But let’s get right back down to the woods because May in France, in both Burgundy and The Loire, is the month of all things white and beautiful. First we have the Lily of the Valley, much loved and exchanged by those of romantic inclination. 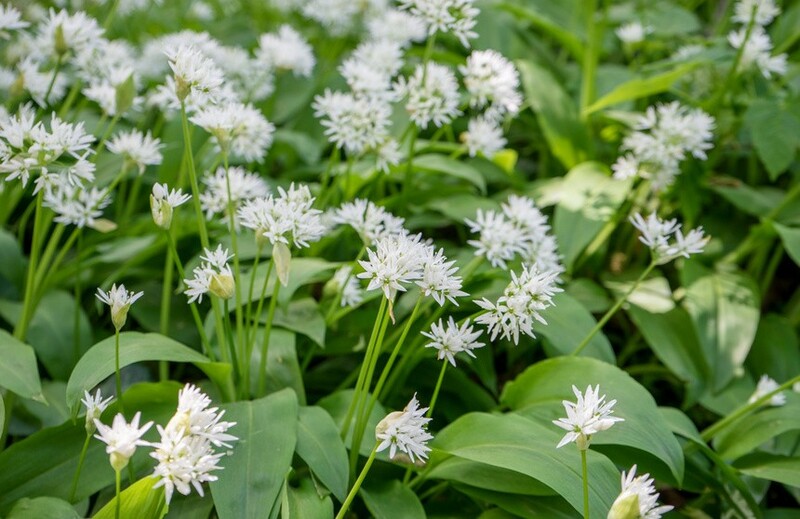 Then, even more spectacularly, we have Wild Garlic, drifts of which carpet the woodland floors and gleam in the dappled light of trees and hedgerows, which appeals to those of a much more culinary leaning. What’s not to love about a forager? Ladies, if you share the belief that the way to a man’s heart lies through his stomach, read on. 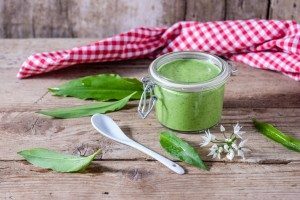 Deep down, foraging for food appeals to every male’s inner caveman and we pick the leaves to put a bit of a kick into salads, and use the stalks in soups, salads, and as a garnish to starters. Perhaps not an aphrodisiac, but certainly a sign of passionate intent! There’s something really special about jumping down onto the tow path, foraging for nature’s bounty along the canal banks, then heading straight back to the galley to prepare something super-delicious for lunch. Our menus always follow the seasons and many of the vegetables, salads and fruits we serve come straight from the gardens of the lock-keepers’ cottages – that means we can support the local economy and, equally importantly, keep the lock-keeper and his wife sweet! The season for ‘ail sauvage’ (although there’s nothing at all ‘savage’ about wild garlic) is short – but that’s what seasons are about. Out of season we revert to bulbs and cloves and few things beat coming back to the barge to the smell of roasting garlic – especially later in the year when the nights start drawing in and the mist hangs over the water. 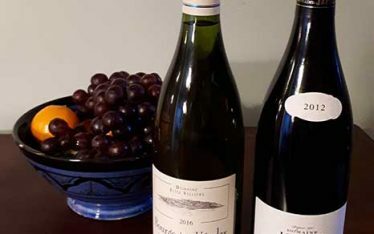 It whets the taste-buds and gives you a thirst for the juice of France’s national fruit – the grape. 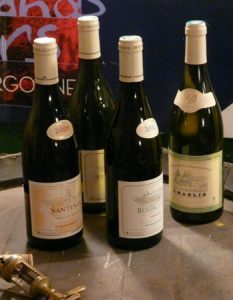 Of which, as you can see, we have a plentiful supply in the cellar, both red and white varieties! I can tell you about the french girl, the garlic, the wine and le Loire, .. and that the best parts of a french dinner are British roasted potatoes and Yorkshire puddings with gravy from the roast. Yes I am still amazed that after all these years I am still in France. It can be a wonderful place to live away from the bureaucratic madness of the UK, but for me (and I’m not alone) food has been one of the biggest disappointments, and the most difficult to deal with.